India is probably one of the few, if not the only, country which has the tradition of collecting milk from a large number of small dairy farmers from rural parts. The collected milk from various collection points or centers is transported in tankers to the centralized processing centers for converting to various products such as toned, double toned, full cream etc. milk. So, what is wrong with this picture? The proponents may ask. Their arguments are typically based on rural employment, scalability and cost efficiency. This in many instances are a valid argument. However, a deeper dive into this industry brings another often hidden facet. Payouts to rural small scale (2-3 cows or buffaloes) dairy farmers are typically Rs. 21 to 24 per lit. This is around 35-45% of the retail price of approximately Rs. 50 to 52 per lit. The low payouts to the dairy farmers does not leave any profit margin for them to provide better feed or medical services or improve cattle breed. It remains just a side income for majority of the farmers. India has a huge milk quality challenge. A large fraction of nation’s milk supply is contaminated or below standard. This is a recurring theme year over year. People in the heat of the moment tend to blame just about anyone and everyone across the whole value chain. Mistakes of the few gets amplified to all. I tend to believe that real culprit may be the structure of the dairy industry in India. Millions of producers with thousand of collection centers increases the potential touch point for contamination. Even a small inadvertent mistake is amplified given the nature of the product. Couple that with the non-refrigerated milk transportation and the problem further magnifies. Industry practice of focusing on fat percentage is too narrow a bench mark of quality. Many of the other important metric such as somatic cell count is not even a consideration. Mixing of milk from various animals such as cows and buffaloes is not even considered an issue. Given that milk is a primary source of nutrition (especially protein) for many children, the narrow focus on fat percentage does not help. Present structure of dairy industry in India was created by the visionary Sardar Patel over 100 years ago. We needed to produce milk for the masses. It was the need of the moment. India, today, stands at a very different spot on economics, demographics and social spectrum. The time has come to take a deeper look into the structure of this important industry. Is high fat percentage a good indicator of milk quality? Historically, the local milkman will add water to dilute the milk before selling. The amount (thickness) of Malai that forms would be less if the water was added to the milk. A quick test and it worked fine. But does the Malai test work in this day and age when approximately of 2/3 of the milk is adulterated and not just with the water? I am afraid not. Does your milkman owns the cows or buffalos or does he collect it from others? What do they feed the cows? Are they roaming around on streets and eating garbage and plastics? How clean is the place? How are they managing the temperature of the milk? Is it pasteurized or homogenized? How much processing has been done to the milk? How is it packed? in a container, glass bottle (how do you clean it? ), food grade pouches etc. Are you mixing the milk of different animals like cows, buffalos and goats? Other animals? Are you using any drugs to enhance the yield? The list is fairly long but above should be some of the first questions you should ask before consuming the milk? This is especially true for young children. You should visit the farm and see with your own eyes and ask tough questions. 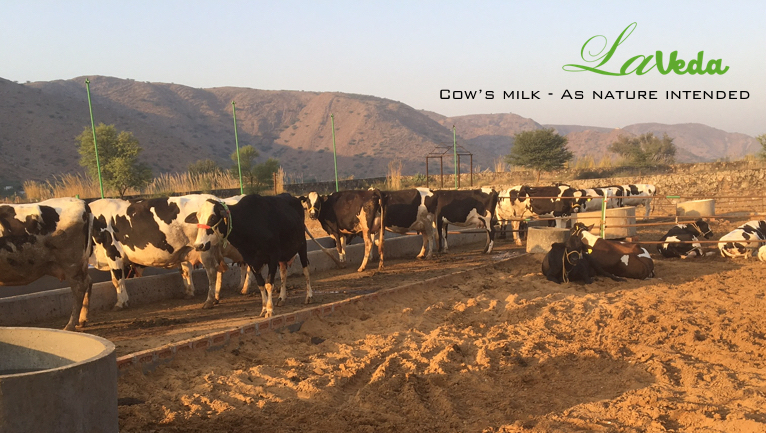 At LaVeda we believe that the milk from our own farm where our own cows are fed a high quality nutritious diet in a safe and hygienic environment is not a luxury but a basic necessity. 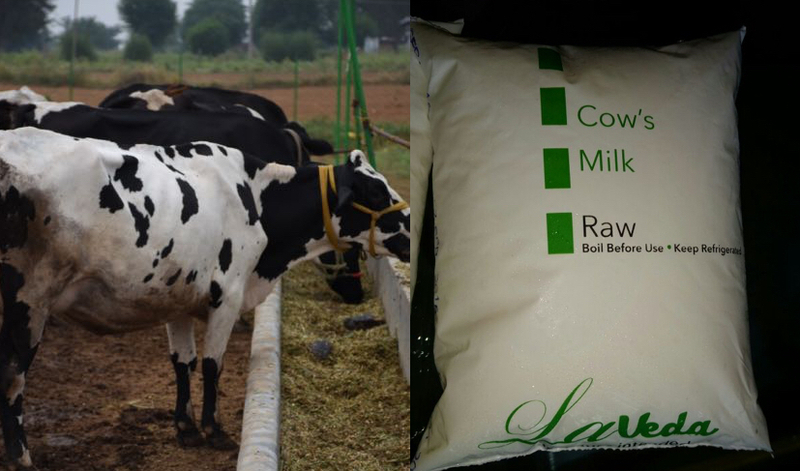 It takes roughly 1-3 days for the milk to reach to you from the farmers for a typical mass produced milk pouches. So much for the fresh milk! 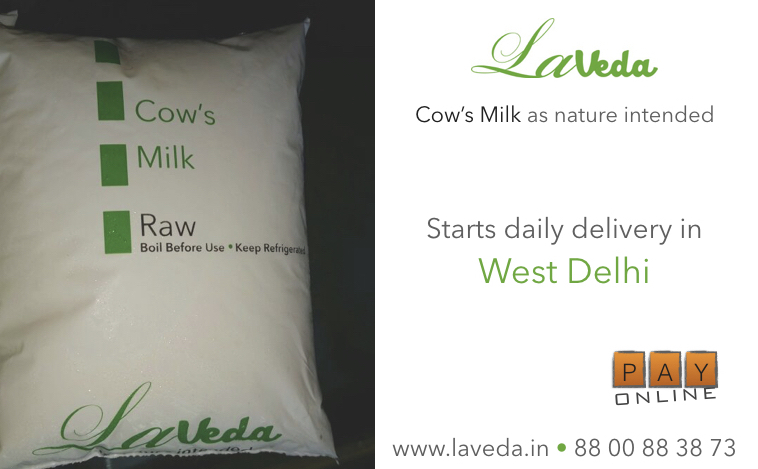 Check out Laveda cow’s milk where we directly supply from our farm to your home and in hours. And the milk is moved in a temperature controlled environment along it’s journey. Indians at large prefer full fat (6% to 8%) milk. For them, it’s the measure of how good the milk is. At first this is baffling as rest of the world is trying to reduce the fat intake its diet. Their focus is on protein and other nutritients. 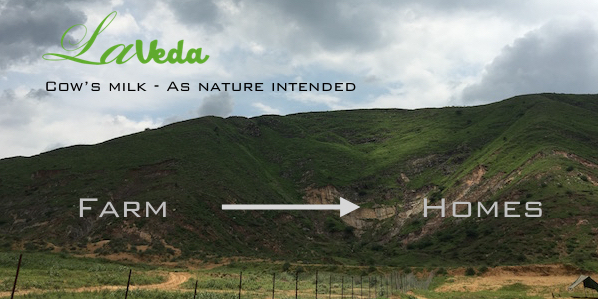 A measure of quality – Historically milk in India was delivered by a local milkman. These milkmen were notorious for mixing water in the milk. This could easily be detected by the resulting lower fat content (lower cream production, read thinner malai). So in due course of time, high fat content milk became synonym with higher quality milk. This is my very unscientific survey. More extensive and scientific studies need to be conducted to understand the habits and how it affects the health of millions of people. Meanwhile, it suffices to say that one should re-examine the beliefs regarding the high fat content milk. May be there was a reason (low fat content among others) why our ancestors preferred natural cow milk!